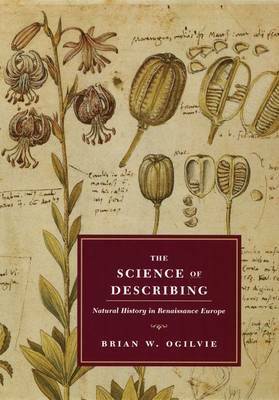 Out of the diverse traditions of medical humanism, classical philology, and natural philosophy, Renaissance naturalists created a new science devoted to discovering and describing plants and animals. In order to distinguish and catalog new plant and animal species, they developed new techniques of observing and recording, created botanical gardens and herbaria, and exchanged correspondence and specimens within an international community. Drawing on published natural histories, manuscript correspondence, garden plans, travelogues, watercolors, and drawings, "The Science of Describing" reconstructs the evolution of this discipline of description through four generations of naturalists.Illustrated with woodcuts, engravings, and photographs, "The Science of Describing" is the first broad interpretation of Renaissance natural history in more than a generation and will appeal widely to an interdisciplinary audience.